Get the skills you need to obtain a spotless exterior. There may not be a magic wand to instantly banish years of mildew, soot, dirt, and grime from your home’s exterior, but pressure washing can get rid of unattractive build-up to restore a tidier look to traditional stucco, aluminum, steel, wood, and brick. Pressure washing can be performed every few years for general maintenance; it’s also a great way to prepare an exterior for painting. The task takes some skill, however, and strict adherence to these guidelines for how to pressure wash a house. 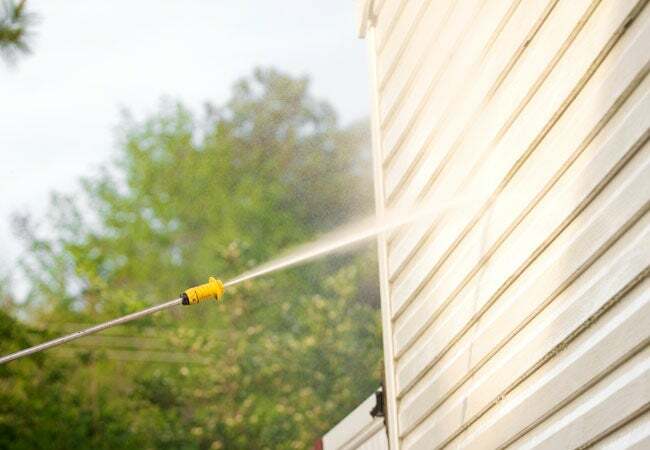 Spraying too aggressively could harm siding or paint—and in fact, pressure washing is not recommended for hardboard, bottle-dash, and rock-dash stucco, all of which could easily be damaged by the process. You’re bound to be in for some physical labor, too: Serious scrubbing is virtually guaranteed if it’s been a long time since the last pressure wash. And failure to follow all safety measures to the letter could result in personal injury (if your home is higher than one story, you may be best advised to hire a pro for the job). 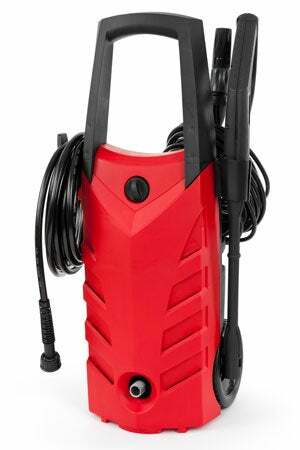 Pressure washers use a high-pressure water spray ideal for tough cleaning jobs on boats, sidewalks, and decks, as well as houses. Their power is measured in pounds per square inch (psi)—the amount of pressure the liquid contents put on the walls of its container. They are available in gas and electric models; the gas variety can create greater psi and is advised for tougher jobs and hardier material. It’s also portable, so better suited to hard-to-reach areas. The psi required for building materials varies. Painted soft-grain wood siding, stucco, and aluminum siding are best treated with 1,200 to 1,500 psi models. For delicate stucco, it’s also best to use a 25- to 30-degree wider spray nozzle to disperse water over a wider area and with less force, preventing any gouging or nicking. For rugged, unpainted materials like brick, stone, vinyl, and steel, it’s recommended to use a machine rated for 2,500 to 3,000 psi. Professionals charge anywhere from 10 to 80 cents per square foot, while gas and electric pressure washers may be rented from large home centers for about $100 a day. If you decide to DIY the job, speak with the rental agent and refer to the manual to ensure you’re picking the right machine for the job. Have the rental agent demonstrate how to attach and detach nozzles to the spraying wand, then try it yourself to become familiar with it. Also, ask for a demonstration on attaching the extension wand as well. Note: The bulky equipment starts at around 75 pounds and can exceed 150 pounds, depending on the power and size of the model, so you may need a helper and a truck to get it home. The instructions ahead are for pressure washing a house with exterior siding. Choose a mild day in spring or fall to tackle the project; preferably avoid strong summer sun, which could dry the cleaning agents before you could rinse them off. With a combination of proper cleaning products, scrubbing, technique, and a good rinse, your home will clean as a whistle once again. • Wear eye protection. Projectiles of dirt, rock, wood, or anything the water hits are a common hazard. • Pressure washers are powerful enough to tear off skin or cause blindness if sprayed at eye-level. Never goof around with the equipment to spray a friend or use it to “rinse” your hands or feet. • Water and electricity are a dangerous combination. Close any outdoor plug outlets, or cover them with duct tape to prevent water from getting inside. Also be aware of any overhead power lines that could be struck by the extension wand, and be careful to avoid these as you work. • Never use a ladder with a power washer. Washer recoil could propel you off right off (even if a helper holds the ladder). Pros commonly use scaffolding, due to the dangerous threat of recoil. If your home is taller than a single story, and you are adamant about DIYing the job, rent, borrow, or buy (for about $200) a six-foot rolling, lockable-wheel scaffolding. Combined with your reach and a 12-foot extension wand, you could be able to manage 24 feet of cleaning. Protect shrubbery, gardens, lawn, and by covering with drop cloths or plastic sheeting. Secure all sheeting/cloths with duct tape. Follow the package’s instructions for your detergent with mildewcide (available where you rent the machine or home centers) to mix it with water in the five-gallon bucket. Add bleach at a volume of one part for every nine parts of the mildewcide-detergent solution. Pour this solution into the garden sprayer. Set the pressure washer up prior to scrubbing so it will be ready to go. Locate the hose mount on the back of the pressure washer, and attach the garden hose to this mount as well as to the hose faucet on the outside of the house. For harder surfaces and a higher psi, use a 15-degree spray nozzle. For softer surfaces and a lower psi, choose a 25- or 30-degree nozzle. If you’re doing a two-story structure, you’ll want to do the top floor first, so attach the extension wand. Also set up the scaffolding in advance, following manufacturer’s instructions. Position it far enough from the wall that you can stand in the center of the scaffolding and have between 1.5- to 3-feet reach, with the wand held comfortably in hand. Remember to lock the wheels in position before using the scaffold. Thoroughly spray a six- to 10-foot section of a single floor of your home with the mildewcide solution. Starting from the bottom of the section and working your way up, gently but firmly scour the siding with the soft siding brush. Working “up” is most effective because, if you start from the top, suds and liquid will run down the wall, potentially obscuring sections enough that you overlook them. If doing a two-story home, start scrubbing on the top floor first, but cleaning from the scaffolding’s “floor” up to the top of the house. Once the first section is thoroughly scrubbed, don the safety goggles. Standing a three-foot nozzle-to-wall distance, turn on the pressure washer. If this stance allows you to remove dirt without damage, maintain it. If not, move in at increments of four to six inches and gauge the cleaning power, and continue to work from whatever distance seems fitting. Once you’ve established the right distance, start at the top of the scrubbed section. Spray overhangs first and work your way down. 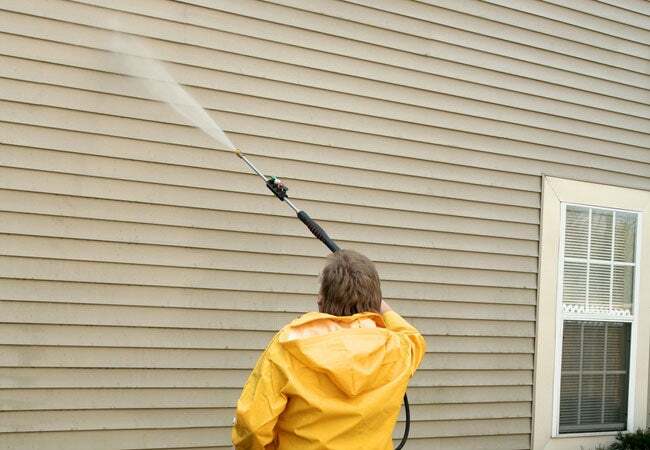 To prevent water from getting under the siding, reach up with both arms (as high as you can safely without recoil knocking you off balance) and angle the sprayer down to a 45-degree angle. Move on to the next section, repeating Steps 4 through 6, until you’ve cleaned the entire home. When finished, pull up the drop cloths and plastic sheeting, toss the duct tape out, and put the cleaning agents and equipment away. Wait at least two days for the exterior to dry thoroughly before any paintwork you plan to do—or simply admire your sparkling clean home!